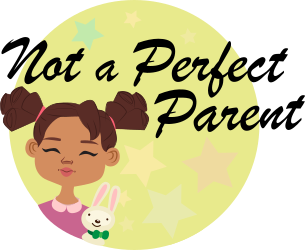 Lola has so many toys and 95% of them were presents when she was born!! At the moment she has a few favourites! 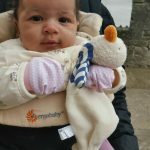 Sophie la Giraffe goes EVERYWHERE with us! Lola loves Sophie! Sophie is a fantastic teething toy. We do get told all the time that it looks like a dog toy but we don’t get care as it’s fantastic for Lola and her gums! Lola loves to play with these in the bath. 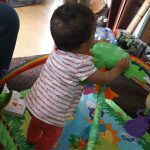 Recently as she loves them so much we have given her a few to play with whilst she is just sat in the high chair playing. 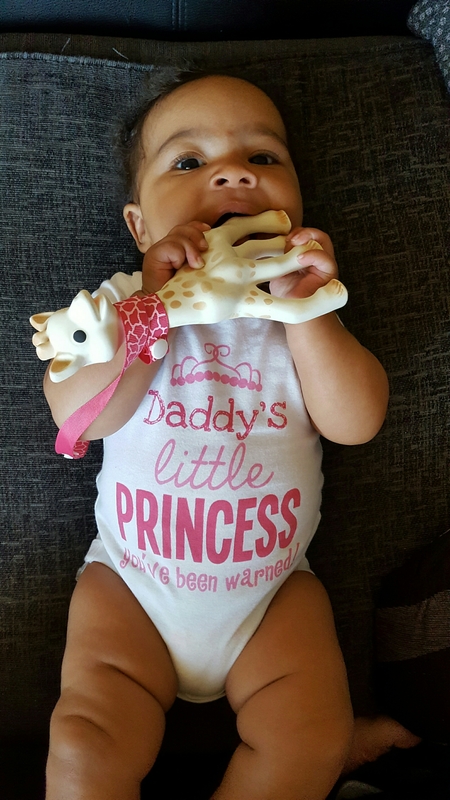 They do say they aren’t teething toys but it’s hard to stop her putting them in her mouth as she loves the sound of them rubbing on her gums! Lola is crying in the photo because she can’t find any of the letters!!! As soon as we gave her more she stopped instantly! 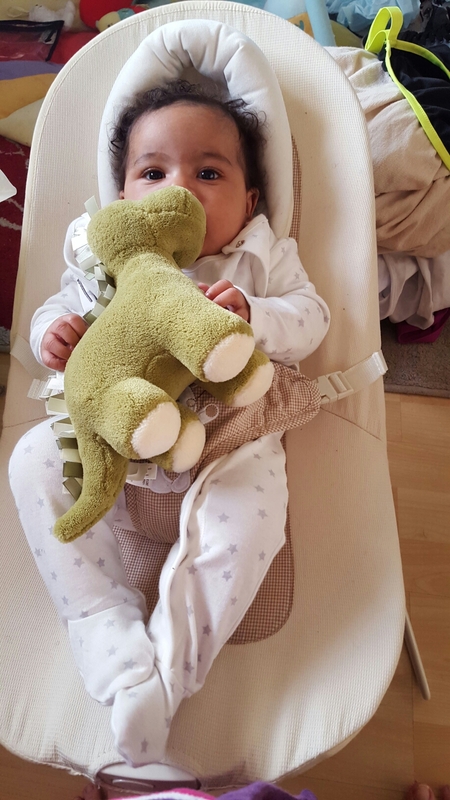 Auntie Chloe has named the Dinosaur Donald…….. (only Auntie Chloe would!) Uncle Rich bought the Dinosaur for Lola when she was just over a week old. Lola now loves to play with the dinosaur! The tail has been chewed on like crazy! Lola has 2 paddling pools which can be used as ball pools. She has a crab which is kept at her Nanny’s house and a Princess Castle that is at ours. She loves sitting playing with the balls or laying down in them. She does however get extremely frustrated with the crab as the eyes frustrate her on it and she will end up crying in frustration with them! 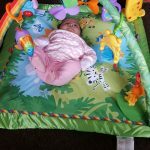 For Easter Nanny brought Lola the Rainforest Play mat and it has been a life saver! The amount of time Lola has spent laying playing under it it has music and lights for her to watch and she used to lay there for ages watching them. Now however she likes to stand against it or tries to pull the toys off! Auntie Chloe bought Lola a duck. That will not be a surprise to anybody that knows Auntie Chloe! Auntie Chloe insists Lola’s first words will be quack! 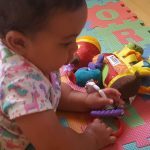 Lola’s Grandad and Granny bought Lola a Lamaze Horse and then soon after a Lamaze Mermaid. Both of which she will usually play with in the car. 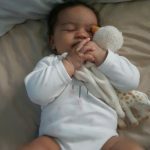 Lamaze toys are fantastic are would fully recommend them to anybody with a baby! 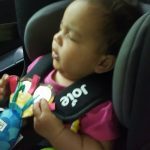 Lola loves the Mermaids tail as it has a small mirror and on both toys she loves the different sounds you can make playing with them. 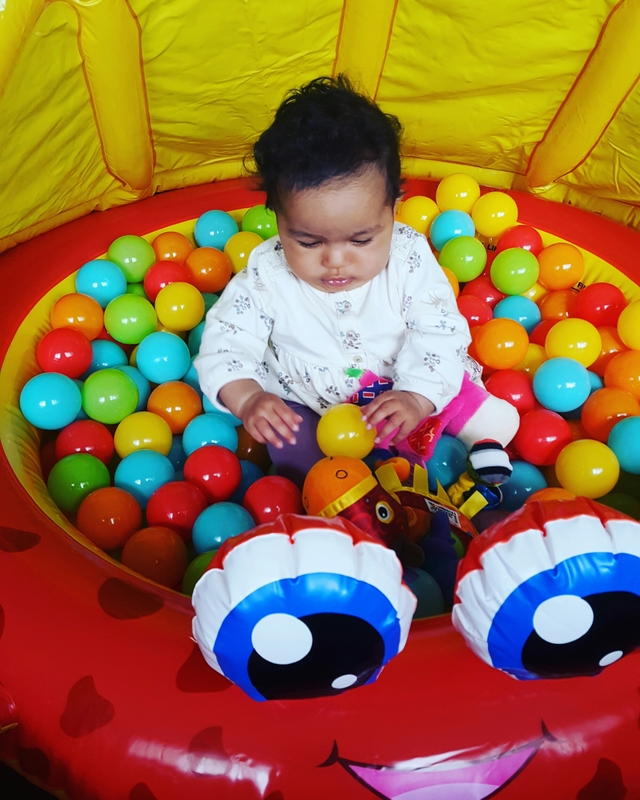 In the above photo of Lola is the ball pool she has the Lamaze horse next to her. These are just a few of Lola’s favourite toys. We do try to seperate her toys so she associates them with different places. Although Lola is spoilt rotten with such a range of toys of course some of her favourites include car keys, bottles, bags and anything that she shouldn’t have!! !